Bathed in the shades of an ancient world, this city is a metropolitan area of another century with its brilliant architecture that celebrates antiquity at its finest. Torun, Poland is located in the northern region of the nation and is situated on the Volun River. Once a capital of the Torun Voivodeship and the Pomeranian Voivodeship, since 1999, Torun is now one of the two capitals of Kuyavian-Pomeranian Voivodeship. One of the oldest cities in Poland, Torun has done a miraculous job in retaining its fine architecture from centuries past. Considered to be one of the most breathtaking places of Europe, Torun is a city beloved by tourists and inhabitants alike. Torun is considered to have a very high quality for both living and standard of living. In 1997, the medieval part of the town was deemed a UNESCO World Heritage Center. Moreover, in 2007, the Old Town was named one of the Seven Wonders of Poland. With so much to see and do in Torun, you must be sure to find a lodging that will allow you to recharge and refresh after each day's excitement. Many of the hostels in Torun can provide just that and a little bit more. 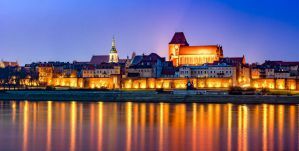 How much do hostels in Torun cost? The only hostel in the Old Town of Torun, the Orange Hostel provides a unique lodging for equally unique individuals. The hostel can be easily found with its big, bright, glowing orange sign on Prostra 19 Street. All bedrooms are shared, and there is a bathroom located on each floor. The Orange Hostel also provides a comfy, cozy common room for you to unwind and socialize with fellow travelers. Though breakfast is not included, there are shops, restaurants, and cafes simply swarming outside the Orange Hostel just for you. The staff has been deemed friendly, helpful, and likeable by many and are always there to assist you with whatever you need. It should be noted that the staff does speak English fluently as well. Other amenities include lockers, a steam room, bicycle parking, and hair dryers for hire. The Orange Hostel only accepts cash as payment. Another orange-themed hostel is none other than Orange Plus, a bubbly, diverse hostel located in the heart of Torun. Surrounding the hostel, a number of pubs, restaurants, shops, and more are waiting to be explored. There are a total of 28 beds with all rooms shared in increments of two, three, four, and ten. The friendly staff are always there to help if you have any questions about the city. As well, free maps, tea, and coffee are provided for all its guests. There is a comfy common room also for your convenience where you can find a TV, DVD player, and a small library. There is a cafe in the Orange Plus, but meals are not included in the original price. There are vending machines scattered throughout hostel for any late night cravings you might have. Other amenities include lockers, hair dryers for hire, a safety deposit box, and lockers. An accommodation that is clean, cozy, and simple, Imbir Hostel is located in the historic center of Torun. Within Imbir's vicinity, you will find museums, churches, ancient ruins, shops, restaurants, and the Biedronka grocery market. Imbir has a total of 39 beds that can be both private or shared. There are bathrooms on every floor as well as a common room for you to socialize in. Within the common room, a TV and Wii can be found. A kitchenette is provided as well as free tea and coffee. For those traveling with families, there is a neat corner for little ones to play. However, meals are not provided within the hostel and can be found just minutes outside Imbir's doorway. Other amenities include washing machines, steam rooms, and hair dryers. Reservations can be cancelled within 72 hours before your arrival. Imbir only accepts cash as payment. A hostel with a whimsical design, Hostel Torun Glowny is located across the river, near the Central Railway Station, the Bulwar Filadelfijski Promenade, and the Copernicus Monument in the Old Town. All bedrooms are shared, and bathrooms are provided on each floor. Each bedroom includes bunk beds, a wardrobe, bed linen, reading lights, and dining table. To provide guests with peace and tranquility, all rooms are soundproof. There is a common room that you can socialize in, where there is a TV and book exchange. A great, hearty breakfast is included in the original price for all guests. Other amenities include steam rooms, hair dryers for hire, meeting rooms, key card access, bicycle parking and lockers. Enjoy your time in Torun!